Support DocumentationAdministrator FAQHow do I add new users? 4. Locate the appropriate code click on it to reveal its options. Select Add Users. Not Sure Which Permission Level to Use? 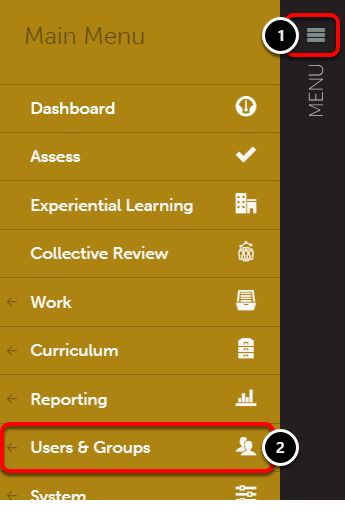 If you are uncertain of which user type (Student, Assessor, Administrator) to create accounts for, please refer to our User Types & Permissions support documentation. You must select a name option (full, full (formatted), or First AND Last), as well as an email address in order to create a user in Chalk & Wire. Full Name: Enter the user's full name, formatted as "First Last" (i.e. John Doe). The column header should be name. Full Name (formatted): Enter the user's full name, formatted as "Last, First" (i.e. Doe, John). The column header should be name_full. First Name: Enter the user's first name, formatted as "First" (i.e. John). The column header should be first_name. Last Name: Enter the user's last name, formatted as "Last" (i.e. Doe). The column header should be last_name. Email Address: Enter the user's email address. The column header should be email. Requested User ID: Enter the User ID that you would like for this user to employ during login. If this column is not defined, a user ID will be automatically generated. The column header should be requested_userid. Password: Enter the password that you would like for this user to employ during login. If this column is not defined, a password will be automatically generated. The column header should be requested_password. Student Number: Enter the user's student number. The column header should be student_number. Group Name(s): Enter the group(s)/department(s) to which you would like to add the user. 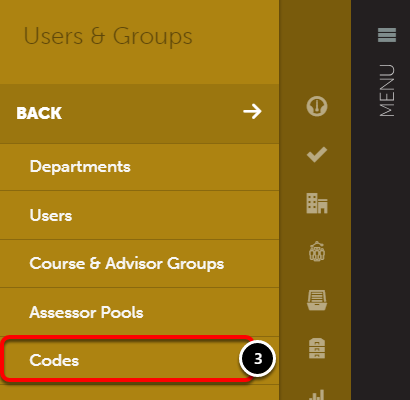 Adding the following characters before the group name will add the following permissions: @ = Administrator Override, * = Assessor Override (Course Groups only), % = Group Owner (Course and Advisor Groups only). 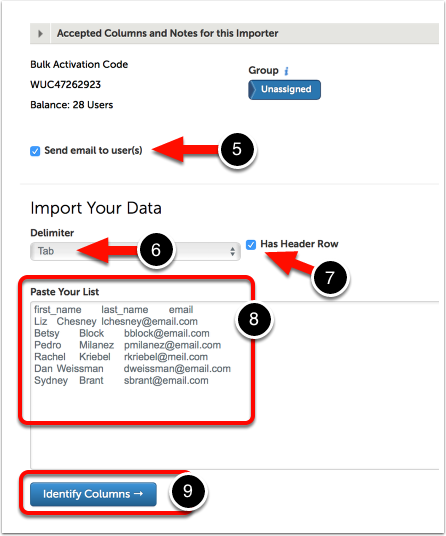 If you are adding the user to multiple groups, use a pipe ( | ) to separate them. The column header should be group_names. Bulk Code: You may specify a different bulk code than the one you selected in the first step of the importing process. If a bulk code column is used, the code for the individual row(s) will override the initial code selection. The column header should be bulk_code. 5. Select whether or not you would like to send an email to the new user(s) upon account creation. The email will contain pertinent information, such as login ID and password. 6. Select the Delimiter style (tab, pipe, comma). If you will be copying and pasting the user's information from an Excel spreadsheet, select the tab delimiter. If you will be typing the text in manually, it is recommended that you use the comma (,) or pipe (|) delimiters. 7. Select whether or not your import text contains a header row. If you include a header row, the columns will be defined automatically in the next step. 8. Enter the new user(s) information into the text-entry box by copying and pasting from an Excel spreadsheet OR by manually entering the information. You must enter a valid email address for all new users in order create the account. When pasting information from an Excel spreadsheet, do not include empty cells from the spreadsheet. They will cause an error when creating the accounts. Only highlight and copy cells containing the user information. A sample of your import text will appear on the screen, which you will use to define your columns. The content that does not appear in this sample will be included in the import. 9. Confirm that your columns are defined correctly OR define your columns using the drop-down menus. 11. Click on the Finished. Import my Data button. The new accounts will be confirmed in green and a summary of the new accounts will be provided. Next: How do I renew a user?